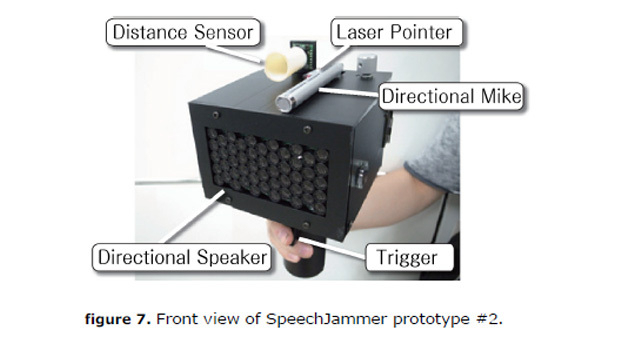 The SpeechJammer is a device that works by "shooting" the offending voice back at the source, according to a paper published by Kazutaka Kurihara and Koji Tsukada from the National Institute of Advanced Industrial Science and Technology and Ochanomizu University. One of the intended uses for the device is to use it to silence people at public demonstrations. It's not an exact match, but in 1957 story Silence Please, Arthur C. Clarke wrote about the Fenton Silencer, which could have a similar result. From Speechjammer via CBS News. Thanks to the anonymous reader who suggested this story.